Drum-roll, please. 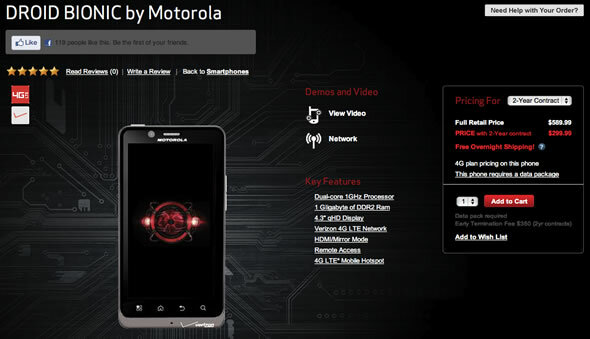 The Motorola Droid Bionic has finally hit Verizon and is today available to order for $300 with a two year contract. We’ve been expecting the 4.3-inch, dual-core 1GHz, 4G LTE Android phone from Motorola for a while now and although it’s late to the party, we’re glad it’s finally here. If you’ve been holding your breath for this, head over to Verizon’s page to order yours today; or you can wait just a bit longer for the iPhone 5 or even the Nexus/Droid Prime, which shouldn’t be too far off. 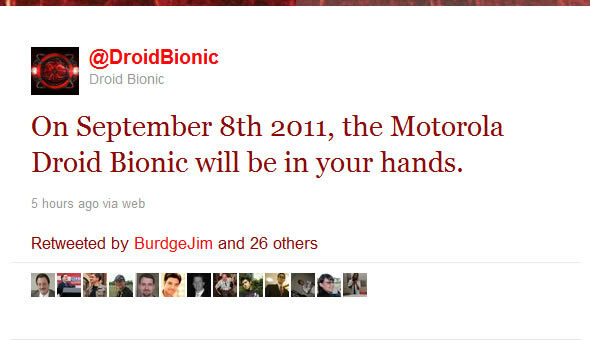 One of the most anticipated smartphones on Verizon this year, the Motorola Droid Bionic, has just been confirmed to be released on September 8th courtesy of an official tweet. The Bionic will be released on Verizon’s 4G LTE network (that means fast 5-12 Mbps download speeds). The phone has a dual-core 1Ghz TI OMAP 4430 processor, a 4.3-inch qHD screen (960 x 540), 8MP back and VGA front facing cameras and 14GB of internal storage. UPDATE: Verizon has come out saying that the @DroidBionic twitter account is not theirs, though it doesn’t officially refute or confirm rumors on release timing. The Bionic saga continues.